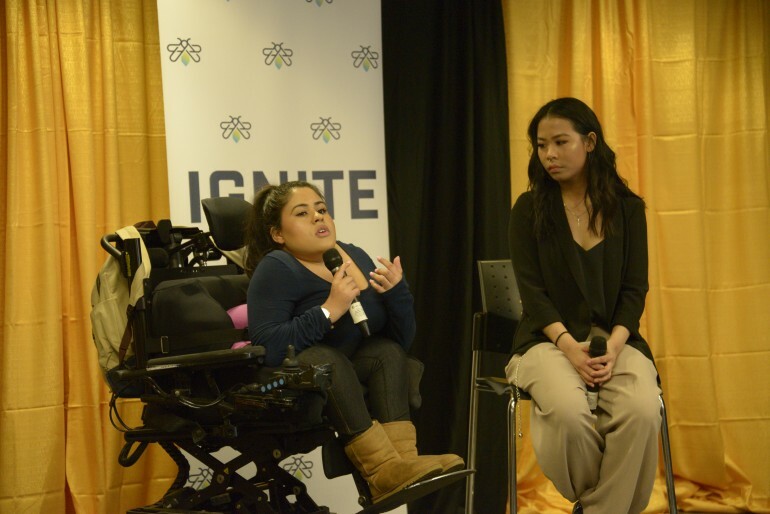 IGNITE Presidential candidates Monica Khosla and Allisa Lim at the Lakeshore Candidate Forum on Tuesday. 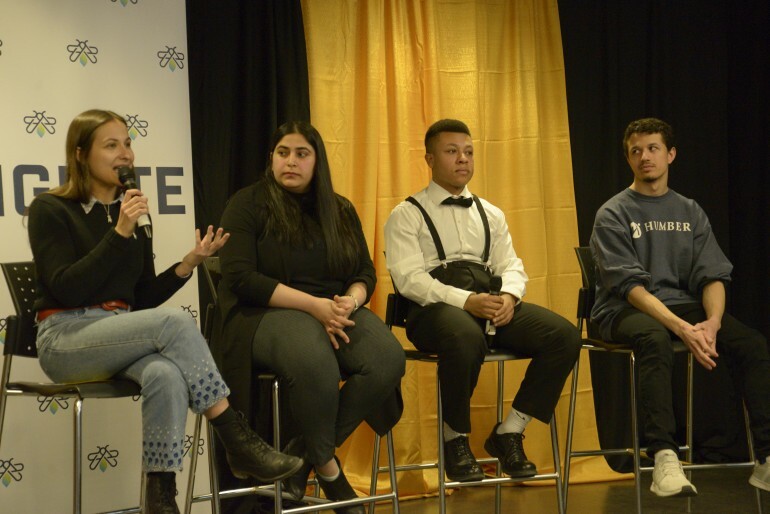 The IGNITE Lakeshore candidate forum Tuesday saw candidates on all platforms emphasize the importance of communication in their prospective roles. Forum participants included the two presidential candidates, Allisa Lim and Monica Khosla; four Lakeshore vice president candidates, Layna Lubimiv, Khatira Mahmoodi, Graham Budgeon, and Joshua Davenport; and five of the six Lakeshore nominees for board of directors. The election candidates gathered in the campus’ L Building cafeteria to deliver their platform promises and field questions from a panel of current board of directors Nicholas Davenport, Allyson Sander and Niña Jocson. The audience, including those watching the online livestream, also asked questions. The election outlined their platforms and campaign promises, as well as other issues such as communicating with students, mental wellness, campus food options and online accessibility to IGNITE. VP Lakeshore candidates, L to R: Layna Lubimiv, Khatira Mahmoodi, Joshua Anthony Davenport, and Graham Budgeon present the communication and other plans for students if chosen to be the vice-president of IGNITE. Lakeshore vice president candidate Budgeon, who currently serves on the campus’ board of directors, wants to implement an online portal dubbed “Societies,” which he believes will not only open users to better communication with IGNITE but create a student networking system as well. He also wants to create a permanent IGNITE desk on the first floor of the L Building with someone stationed there to guide students. The portal would work in partnership with the desk in booking appointments there, should students need additional help or support, Budgeon said. VP candidate Davenport promises to improve communication at Humber and plans on doing this by developing an app which he believes will bridge the gap between students in the same programs. The app would also include an events tab to see what’s going on at Humber and a place for students to chat with each other, he said. “Every student in the school would be able to communicate with one another which would help end the segregation I feel students have in their programs,” Davenport said. “It’s kind of hard to meet people here, especially if you’re shy and coming from a place where you don’t know how to speak English that well. “The app would help you communicate better and improve your college experience here,” he said. VP candidate Lubimiv’s platform is all about communication, mental wellness and sustainability on campus. As part of improving student mental health, Lubimiv would like to introduce plants and vines into the school which she explained help clean toxins from the air. As for communication, she wants to create opportunities for each educational stream to have a student representative in IGNITE to act as the word of mouth for events hosted on campus, she said. Making the food on campus reflect Humber’s diverse student body, something VP candidate Mahmoodi feels is not currently happening, is part of her platform. She would also like to make the food more affordable for students to alleviate financial stress, she said. Her platform also promises to better communication with the colleges through feedback given from students. Presidential candidate Allisa Lim, who is also the current Lakeshore VP, said her top priority is completing the menstrual project she implemented in January and then focus on increasing student voices and opportunities on campus. However, Monica Khosla, the other presidential candidate, is promising advocacy, accessibility and awareness, said they are all equally important. Panelists asked Lim if she believes her menstrual project is something IGNITE should continue or if another organization should take on the responsibility. Lim said a survey conducted following the launch of the project revealed about 90 per cent of voters want to keep the program, which she describes as clear proof the project should be continued. This could mean meeting with location holders of the free menstrual kits such as the LGBTQ centre to see if they would be interested in taking on the project, she said. Both presidential candidates were asked how they would increase communication with the student body. Lim said she would ask students what they want from IGNITE and figure out how to improve existing services. Khosla said many students might be intimidated by IGNITE and won’t share their opinions. She wants to be available to students in any way, which could include contacting her for one-on-one interactions. More than anything, she said she wants to be a voice for the students. Voting is the week of March 12. Polls close March 16 when the winners will be announced.